"Tiffany Haddish (born December 3, 1979) is an American actress, singer, model, comedian, and author. After guest starring on several television series, Haddish gained prominence as Jackie on the first season of the OWN television drama If Loving You Is Wrong from 2014 to 2015. From 2015 to 2017, she starred as Nekeisha Williams on the NBC sitcom The Carmichael Show. After appearing in the 2016 comedy film Keanu, Haddish made her film breakthrough as Dina in the 2017 film Girls Trip, for which she received critical acclaim for her performance. In 2017, she published her memoir, The Last Black Unicorn. Haddish was born and raised in Los Angeles, California. Her father, Tsihaye Reda Haddish, was a refugee from Eritrea, and was from an Ethiopian Jewish family. Her mother, Leola, was an African-American small business owner and a Jehovah's Witness. After Haddish's father left when she was three years old, her mother remarried and went on to have more children; Haddish has two half-sisters and two half-brothers. In 1988 while living in Colton, California, Haddish's stepfather tampered with the brakes on her mother’s car, leading to an accident in which Leola suffered severe brain damage. The tampering was allegedly intended to harm Haddish and her siblings as well, but they had opted to stay home on the day of the accident. Her stepfather disclosed this to her while having dinner. The brain damage possibly triggered Leola's schizophrenia. Haddish, then age nine and the oldest of her five siblings, became the primary caregiver for her family. At 12, Haddish and her siblings were put into foster care where they were temporarily separated from each other. While there, she used comedy as a way to cope with being in situations with new people. When she was 15, she and her siblings were reunited under the care of their grandmother. She attended George Ellery Hale Middle School in Woodland Hills and graduated from El Camino Real High School, also in Woodland Hills, where she was the school mascot. Haddish said she could not read very well until high school, but improved when she received tutoring from a teacher. She also got in a lot of trouble at school, despite her award-winning participation in drama competition featuring Shakespearean monologues. In 1997, after her social worker gave her an ultimatum to either attend psychiatric therapy or go to the Laugh Factory Comedy Camp, then 17-year-old Haddish opted for comedy as outlet for her pain. She has said that the mentorship from many notable comedians—including Richard Pryor, Dane Cook, Charles Fleischer, the Wayans brothers—helped her discover her passion for comedy and it "literally saved her life." She has said that she incorporates her past real life experiences in her sets, finding that doing so functions as a sort of "safe space" for her. Haddish stated in 2018 that at the age of seventeen she was sexually assaulted by a police cadet. She has stated that this led to her having an aggressive front when it comes to avoiding unwanted advances from men. In 2016, she co-starred opposite Jordan Peele and Keegan-Michael Key in the comedy film Keanu in the role of Hi C.
In 2017, Haddish starred alongside Queen Latifah, Jada Pinkett Smith, and Regina Hall in the comedy film Girls Trip for Universal Pictures. The film received widely positive reviews, with an approval rating of 90% on Rotten Tomatoes and a "generally favorable reviews" score of 71/100 from Metacritic; it also became a box-office hit, becoming the highest-grossing comedy of 2017. Her performance was cited by many critics as a Bridesmaids Melissa McCarthy–style breakout. In the Chicago Tribune, Katie Walsh wrote, "this is Haddish's movie, and will make her a star. It's clear from the moment she hits the screen." In August 2017, Haddish's comedy special, Tiffany Haddish: She Ready! From the Hood to Hollywood, premiered on Showtime. Reviewing the special for Vox, Caroline Framke wrote, "Tiffany Haddish is just really damn funny, and deserves a recommendation wherever we can give it to her...Haddish unleashes hilarious, filthy, and even moving anecdotes to tell the story of her life to this point, without anything holding her back, at long last." She also co-hosted the BET game show Face Value with Deon Cole. On November 11, 2017, Haddish became the first black female stand-up comedian to host Saturday Night Live. 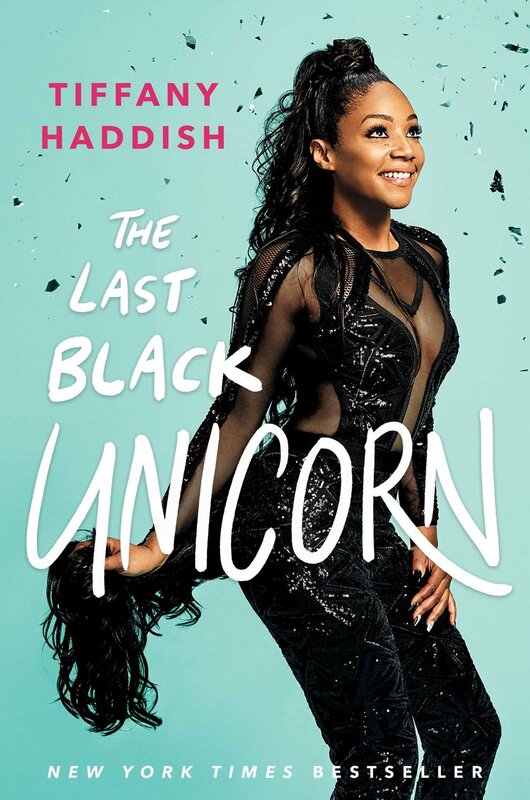 Haddish's memoir, The Last Black Unicorn, was released in December 2017 by Simon & Schuster; it debuted at number 15 on The New York Times best-seller list. It was ghostwritten with Tucker Max. As of 2018, Haddish stars opposite Tracy Morgan in the TBS sitcom, The Last O.G., her first lead in a sitcom. Her 2018 film roles include a supporting part in Uncle Drew, and a lead role, opposite Kevin Hart, in the comedy Night School, reuniting with Girls Trip director Malcolm D. Lee. In parallel, she star in the Tyler Perry's movie Nobody's Fool, alongside Tika Sumpter, Omari Hardwick, Mehcad Brooks, Amber Riley and Whoopi Goldberg. The film received generally good reviews from critics and has grossed over $33 million worldwide. In 2018, Haddish signed a first-look deal with HBO. In addition, she was also announced as the voice of Tuca on the Netflix animated comedy series Tuca & Bertie, premiering in May 2019. Haddish provides the voice of Queen Watevra Wa’Nabi in The Lego Movie 2: The Second Part, and is set to lead the comedy Limited Partners for Paramount Pictures. As described in her memoir, Haddish married and divorced William Stewart twice. Her ex-husband helped Haddish locate her once-estranged father who walked her down the aisle at their first wedding, which she once described as "one of the happiest days of my life." She filed for divorce in Los Angeles County, California, in 2011 and 2013.